GIVEAWAY! 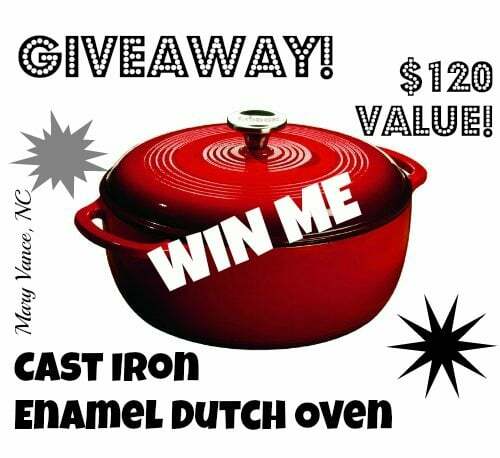 Enter to Win This Cast Iron Enamel Dutch Oven! Guess what? It’s a GIVEAWAY! Each month I let fans vote for the next giveaway prize on my facebook page, so make sure you ‘like’ me on facebook to participate! I asked my facebook fans to vote for this awesome prize (join me on Facebook so you can be involved in the selection process next time, AND get my awesome tips and updates), and the awesome prize is this Lodge Cast Iron Enamel Dutch Oven! This thing is beautiful and great for cooking, marinating, refrigeration and freezing. It lasts a lifetime, transfers easily from stove-to-oven cooking, and heats evenly. It’s SIX quarts and comes in delightful colors and has a lovely enamel, chip resistant and easy-to-clean coating. I have chosen a winner, and the winner is Minette Lemieux! Congratulations! Please email info(AT)maryvancenc(DOT)com with your shipping address within 72 hours to claim your prize. Click the link for the Cast Iron Enamel Dutch Oven to check out the awesome prize. Giveaway begins Monday, October 28, 2013, at 4pm PST. Giveaway ends Tuesday, November 5th, 2013, at 8pm PST. Winner will be announced on my site, www.maryvancenc.com, on Wednesday, November 6th. The winner will be chosen at random by Rafflecopter. Be sure to check back on Wednesday, 11/6/13 to see if you are the WINNER! The winner will have 48 hours to respond by email. This giveaway is open to U.S. residents only. Void where prohibited. GOOD LUCK! I tweeted and pinned, but may not have gotten the urls right. User name for twitter is @wineandsong. Hope I’m entered! Would love to win this! I need to get rid of my nonstick cookware! Thanks for the giveaway! Awesome gift! I kept trying to Pin it, but something kept going wrong. I’ll try again tomorrow! I can’t pin it, every time I try.. says invalid image. It is working fine from my end and other testers… sometimes Pinteest has hiccups, so try closing out of it and trying again. Thanks for the great giveaway! I pinned and did the other things, but don’t do Twitter.